We are now about a year and a half into the AMD EPYC product cycle. At STH, we have been mostly talking about the same SKUs for several quarters. In 2017, to be frank, there were a limited number of platforms in the market for AMD’s first generation “Naples” platform. AMD has been working on getting systems out and we have reviewed, or are in the process of reviewing systems from just about every major vendor. At SC18, there was a buzz about AMD EPYC, and we know that the next-generation “Rome” AMD EPYC Gen2 is going to change the game and will completely out-pace anything Intel has from a core count and PCIe lane perspective in mainstream sockets (excluding Cascade Lake-AP which will be more of a niche platform.) 2019 will be some of the fastest paces of innovation we have seen in the server space in years. This innovation is starting with the existing Naples platform. If you have not read it yet, our AMD EPYC 7371 review and benchmarks show why the chip is an important industry milestone. What we missed in our AMD EPYC 7371 article is pricing which just arrived in our inbox. Frequency optimized SKUs are important. As the number of cores per x86 socket has steadily increased over the past decade, that has had a profound impact on licensing. Vendors such as Microsoft for applications like Windows Server and SQL server, Oracle for its database software, and others have moved to per-core licensing. With per core license costs that can often cost more than the entire CPU itself, Intel started providing specialized SKUs for these markets. The hallmark of these SKUs has been lower core counts, with more cache per core and higher clock speeds per core. When you can spend five figures or more per core on software, you want to optimize on clock speed to maximize your software investment per core. We saw examples such as the Intel Xeon Gold 6134 and Silver 4112 as SKUs designed in this generation around lower core counts and higher clocks. If you read many of our articles around AMD EPYC, we note that EPYC launched in 2017 valuing performance per socket rather than performance per core. From an IPC perspective, clock-for-clock AMD EPYC (Naples) and Intel Xeon Scalable (Skylake-SP) trade blows as to which one is faster in a given benchmark. At a product level, this means that Intel’s generally higher turbo boost, often 3.7GHz in the Xeon Gold 6100 range, has helped it retain a per-core performance advantage over AMD EPYC. AMD meanwhile simply offers more cores per dollar, and more memory/ PCIe bandwidth which means if you need to scale out, it has been the performance leader in this generation. With the addition of a few frequency optimized SKUs, AMD EPYC is changing that mid-cycle. 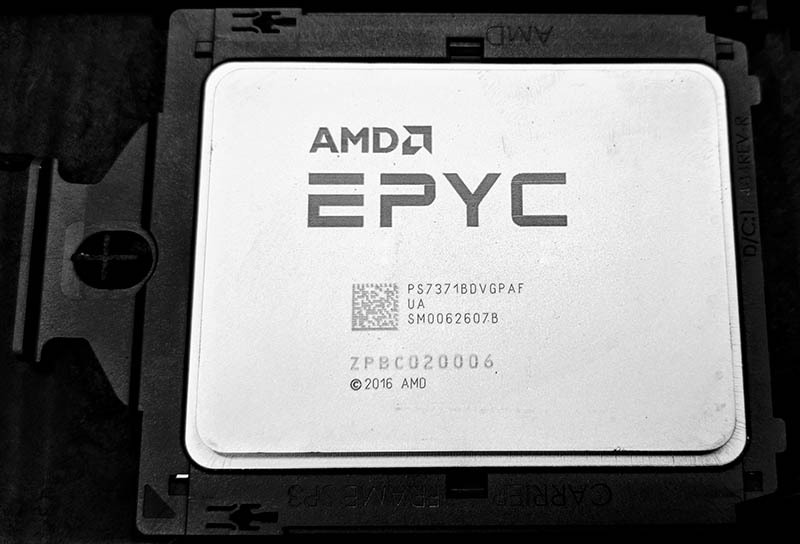 We recently benchmarked the AMD EPYC 7371 which can match clock speed with Intel Xeon Scalable taking away one of Intel’s biggest competitive advantages. Alongside or AMD EPYC 7371 benchmarks and review piece, we wanted to show why, as these SKUs become generally available in Q1 2019, they are going to change the narrative we have had for the past year. While one can easily dismiss 700MHz as a “minor” upgrade it is profound on a few levels. First, AMD is offering a 24% clock speed increase which will see many applications yield a 20%+ increase in performance. That is a big deal as a mid-cycle upgrade. Remember that at the Intel Xeon E5-2600 V4 (Broadwell-EP) Launch we were seeing single digit percentage IPC improvement. When a 16-core offering jumps with 20% more performance mid-cycle that is a huge deal. The more profound impact is that AMD is changing the narrative with this part. 16 cores is a well-known breakpoint since it is the Windows Server Standard and Datacenter reference license core count. With AMD EPYC’s higher memory capacity and now higher per-core clock speeds, the AMD EPYC 7371’s may now be the top choice not just for the VMware virtualization community, but also the Windows Server 2019 ecosystems as well. This just arrived via my inbox this morning. Apologies to our readers, we did not have this for publication earlier this week. The list 1K tray pricing is going to be $1550. I was actually expecting pricing to be significantly higher than that. The $1550 list price puts it in an interesting spot. AMD is essentially charging a 20-25% price uplift for a 20-25% performance per core upgrade over the AMD EPYC 7351 for dual socket configurations. Here is an updated chart from our original review piece with your 16 core CPU options in Q1 2019. As you can see, Intel will need to discount their Xeon Gold 6142 by around 50% or the Xeon Gold 6142M by around 75% to be competitive with the AMD EPYC 7371. When there was a large per-core performance gap, Intel could charge a premium for frequency optimized parts. Now that AMD has closed the gap, and passed Intel’s per core performance in the 16-core CPU market, it has a platform with more RAM capacity and more PCIe lanes along with more performance than the Intel Xeon Gold 6142M, at around a quarter of the price. If I was on AMD’s pricing team, I would have targeted $1800 as a list price. That is still below the Intel Xeon Gold 6130 which the AMD EPYC 7371 generally out-performs by a solid margin. It keeps prices well below the Intel Xeon Gold 6142 and Gold 6142M which will be the closest competitors when vendor SPEC CPU2017 numbers come out. One gets more memory capacity, bandwidth, and PCIe lanes albeit with four NUMA nodes instead of one. At $1550, it changes another market dynamic. CPUs are only a fraction of configured server pricing, and often a small portion. A lower-spec dual socket AMD EPYC 7351 system will run in the $5000-6000 range with a full set of 16 DIMMs. That means that the cost to upgrade your system’s performance by 20-25% through the AMD EPYC 7371 will only be around $600 ($300 x 2 CPUs.) That $600 only amounts to 5% on lower-end configurations and once RAM, networking, storage, and software is added, upgrading to the AMD EPYC 7371 over the 7351 is a low single digit % increase. The good news for our readers is that, although I did pricing in a former life, I am not doing pricing at AMD. $1550 for these chips is absolutely one of the best deals on chips in the market in this performance range. AMD has been extremely aggressive with EPYC pricing and if you are quoting servers early next year, go get an AMD EPYC quote. We have already reported that Intel is Serving Major Xeon Discounts to Combat AMD EPYC and you can now have directly competitive parts on a per-core performance basis versus Intel for Windows Server 2019 and other applications. Yea so there goes the Gold. What’s Intel going to do? They need to do a 100mhz increment part and drop price by like 50% now. I am “hoping” this is a sign how good EPYC 2 will be. The trouble is even with these kind of pricing we still don’t see AMD gaining much in Sever CPU market share. “We have already reported that Intel is Serving Major Xeon Discounts to Combat AMD EPYC” isn’t that the key statement? You say $1550 is “too low” but nobody ever buys the Intel parts at list price, so maybe $1550 is to undercut the extra special VIP year end closeout deal definitely not Intel rebate that the sales team can get. 4 binned Ryzen 5 1500x at $160 a piece -$20 cooler x 2.5 makes $1.400 + 2.5 x$60 for putting them as chiplets. Makes sense to me, nothing wrong with a gross margin of 250% upon the normal margin they already make. 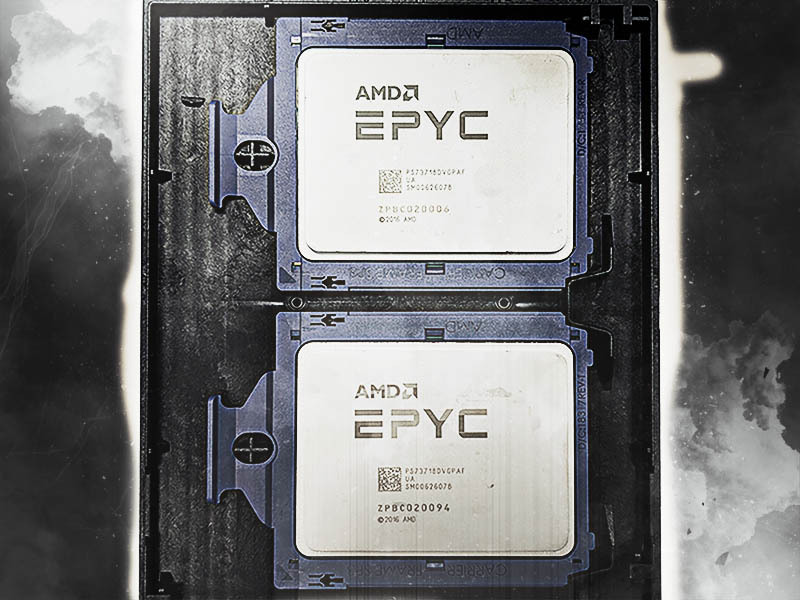 EPYC Rome will give twice the speed(32 cores) with the same TDP and price. We’ve gone from no competition in the server market to AMD coming at Intel like a rabid hyena. $1550 I was like what? Are you sure on that price? It sounds too low. Do you have a second source like a good journalist? Riccardo single e-mail with multiple people from AMD copied. This is an AMD executive formally communicating their product pricing not trying to confirm a rumor. Retail price (the only one I can find) is $1730. I am so happy to see competition. Intel got too greedy. The problem is that many enterprise workloads like virtual machines are not compatible. You can’t just yank an intel vm and put in on amd. The price needs to convince people that even if amd quits CPU production for 4 years again, they won’t go out of business. So the compute price needs to be great. @eddie: I assume enterprises also apply the 4 yr rule you mentioned to intel? Because by the looks of it, intel is getting pretty darn close to shipping no new CPU for 4 years. Purley is not expected to see anything othrr than skylake and Skylake redux, and the next platform will field cooper lake (aka skylake redux redux) until late 2019 when ice lake is expected to make its much belated appearance… Provided 10nm is working and Intel of late hasn’t done much to dispel the skepticism. @Eddie: Isn’t the whole point of running virtualized, if not just for efficiency, to run services while being hardware agnostic? Enterprises that don’t have virtual environments that can be swapped around are doing something terribly wrong… And I don’t see swapping between Intel x86 and AMD x86 architectures being an issue for most modern hypervisors. @ Micah: AMD and Intel are not ISA-compatible at the system level. So some instructions are AMD-only vs. Intel-only. This is mostly a consequence of the two parties not coordinating with each other and I’d blame Intel for this since they own most of the ISA spec apart from AMD64 (aka x86-64 base ISA). Maybe AMD also is to blame for going its own way in the opteron era, IDK. ANyway, you have instructions that largely do the same thing in each ISA but one doesn’t implement the other’s. So eddie is right that unless the hypervisors take special pains to make the migration seamless (I’m sure it can be done, but AMD’s marketshare over the last decade has de-incentivised any such effort). I have also heard that VMs may not migrate seamlessly across Intel’s own platforms never mind AMD (like — completely made up example — Skylake to IvyBridge or Skylake to Atom). So yeah, x86 at a system level is a mess. You can cold migrate VM’s from Intel to AMD EPYC. The special skylake stuff like avx-512 nobody uses or doesn’t have an alternative for. Most servers out there are pre-skylake. We can absolutely migrate VMs from intel to EPYC. Live migration is the problem, but live migration doesn’t always work from SB to SKL either. Be really careful saying you can’t use it for enterprise stuff. We do every day. We’ve wanted higher per core performance which this has. @eddie , @deltafx2 : AMD indicates it is possible ( https://www.amd.com/system/files/documents/vm-migration-guide.pdf ). Maybe it would be great if ServeTheHome could confirm, and maybe make a tutorial. Greg has it right, usually, you just have to shut them off and cold migrate to a new cluster with the AMD Cpus, its a minor pain, but very minor.